Too many organizations invest in performance management and business intelligence projects, without first establishing the needed conditions to ensure success. But the organizations that lay the groundwork for effective change first reap the benefits. 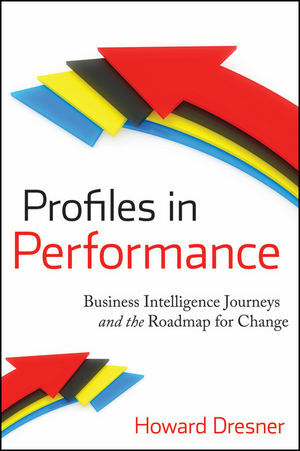 In Profiles in Performance: Business Intelligence Journeys and the Road Map for Change, Howard Dresner (author of The Performance Management Revolution) worked with several extraordinary organizations to understand their thriving "performance-directed culture." In doing so, he developed a unique maturity model-which served as both a filter to select candidates and as a lens to examine accomplishments. The models, analyses and real world accounts from these cases will be an invaluable resource to any organization hoping to improve or initiate their own performance-directed culture. Howard Dresner is President of Dresner Advisory Services, LLC, an independent advisory firm, and is a recognized authority in the areas of business intelligence and performance manage-ment. Prior to his new venture, he spent thirteen years at Gartner, where he was a research fellow and lead analyst for business intelligence, and served as chief strategy officer at Hyperion until forming his own consultancy in 2007. The Maturity Model as an Assessment Tool. CHAPTER 2 Denihan Hospitality Group. A New Era of Growth Begins. An Ownership Change Spawns a Brand-New Company. The Economy Puts the Brakes on Rapid Growth. The Seeds of a Data-Driven Culture Are Planted. New Talent Brings Different Perspectives. Operational and Financial Data Come Together. The Gap between Medical Excellence and Business Performance. A New Leader for the 21stCentury. CHAPTER 4 Northern California Public Broadcasting. Can the Same Standards Be Applied to Nonprofits and For-Profits? Setting the Stage for Public Broadcasting in America. San Francisco's Unique Brand of Public Television. Seismic Changes in Public Broadcasting. A Growing Desire for Stronger Financial Management. New CFO Shakes Things Up. New Owners and a Changing Market Demand a New Focus. Mueller Gets Back on Track. The 21stCentury Brings a New Set of Challenges. Formalizing Performance Management at Mueller. An ERP System that Works! Beyond ERP to Business Intelligence. Mueller Refines its Management System. CHAPTER 6 Tying It All Together.